40 years ago just two weeks after Seychelles became an independent nation, its founding President Sir James R. Mancham, Officier de la Légion d’Honneur, attended in Paris the 14th July French National Day celebration as the guest of honor of President Valéry Giscard d'Estaing and his Prime Minister Jacques Chirac. This year Sir James will not be attending the annual ceremonial occasion. Ironically however, he was this week made a member of the Cercle de l'Union Interalliée, which is considered to be one of France's most prestigious and exclusive private clubs which General de Gaulle referred to as "l'Ambassade de France à Paris". Situated in the upper fashionable Rue du Faubourg, Saint Honoré, in central Paris a few steps away from the Élysée Palace, the Club sits between the Japanese and the British Embassy and is considered as one of Paris' best kept secrets with its own large lush gardens with flowers and forest trees totally unsuspected from the street entrance. Ironically it was President Valéry Giscard d'Estaing's own brother, Olivier Giscard d'Estaing, co-founder of INSEAD who introduced Sir James to this exclusive private club. INSEAD is considered to be one of the world’s leading business schools and was listed by the Financial Times this year to be the No.1 school for international business studies ahead of Harvard University in the USA. At the present the INSEAD school has three campuses – one in Fontainebleau, France, one in Singapore and a third one in Abu Dhabi , UAE. Yesterday (Tuesday 5th July), in the company of Mr Olivier Giscard d'Estaing, Sir James met with a selected number of the Executive Board of the School which included Peter Zemsky, the deputy Dean, with Hans H. Wahl, Director of Social Entrepreneurship Initiative and with Christine Hirzel, Global Head of Boards and External Relations at their exclusive and highly modern campus in Fontainebleau to discuss a possible win-win collaboration between the University of Seychelles School of Business Studies and INSEAD. Sir James told his host that Seychelles is a small country which thinks tall and that as INSEAD was active in Europe, Asia and the Middle East, Seychelles could constitute an important hub for its educational activities and social entrepreneurship agenda particularly for the continent of Africa. "Africa needs more entrepreneurs and less politicians and Generals", Sir James said. The parties agreed to further follow up on this possibility. 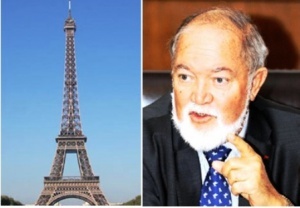 He said that considering France's special relationship with Seychelles and other nations of the western Indian Ocean, he felt it was appropriate for him to make a first briefing of this new development to the French authorities. Sir James leaves Paris today for Hamburg where he is scheduled to meet with members of the Board of Directors of the World Future Council (WFC), following which he will be visiting London for a business lunch with the Secretary General of the Commonwealth Baroness Scotland, PC, QC – all to do with the Peace Centre project. He said he was overwhelmed and very encouraged on the overall reaction of many international institutions who are, in principle, supportive of the University of Seychelles launching of a ‘Sir James Mancham International Centre for Peace Studies and Diplomacy’.